Betcha Never Done THIS with Your ‘Bucha! I cannot believe I’m putting this face on the internet for you readers. Please do not Pin this, for heaven’s sake. That’s what the picture of the KB jar is for! Do not be afraid! This is only a kombucha blog post! 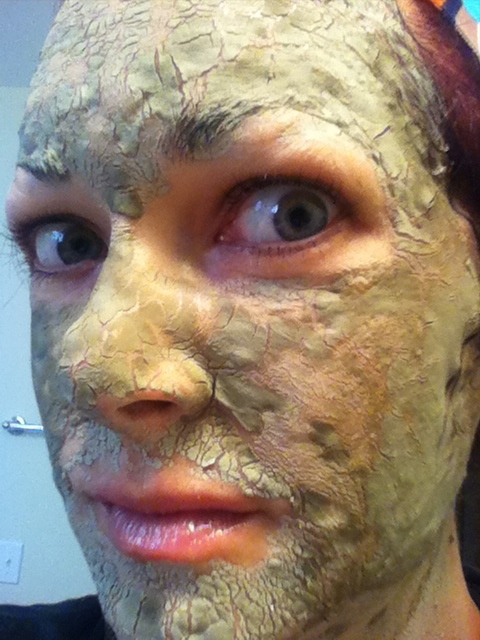 I have not turned into a zombie from Walking Dead! It starts out pretty light. It gets darker in color and tighter in skin sucking tightness, the longer you let it dry. 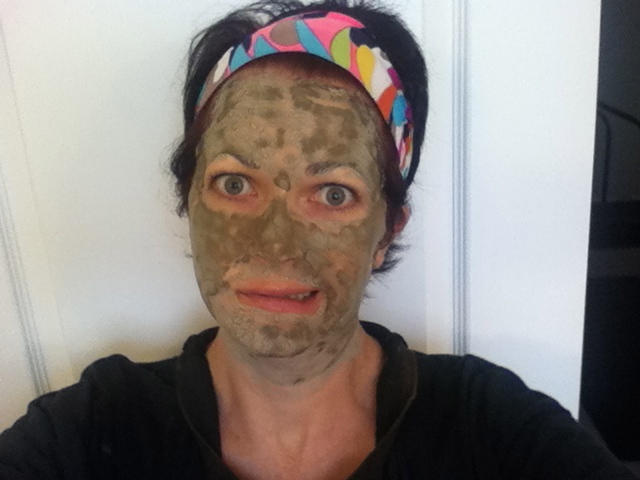 Oh, the things I do for a good post! I could barely move my face at this point, and it was only about half dry. See, pretty red, but it didn’t last for long. So, now you have something brand new to do with all that lovely kombucha you’re making and buying across America these days! If you haven’t tried it yet, go get some! 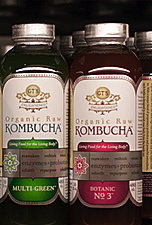 I’m going to add links below so you can read lots more about the health benefits of kombucha. 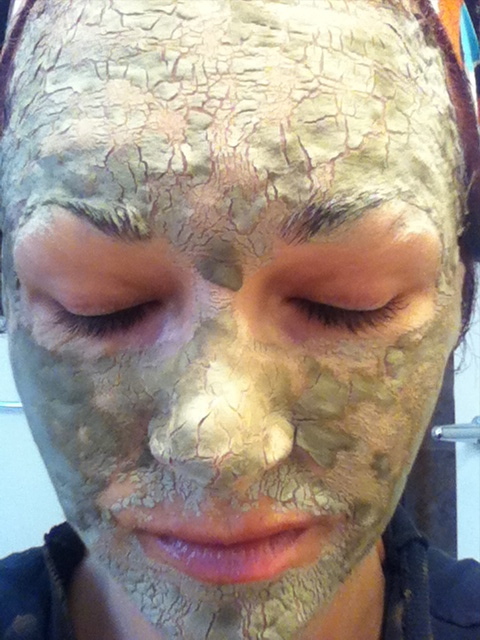 And if you order the mask and try it, please let me know! What other unusual things have you used kombucha for??? Anyone want to admit to being a WD fan? It has a great story line, really!! 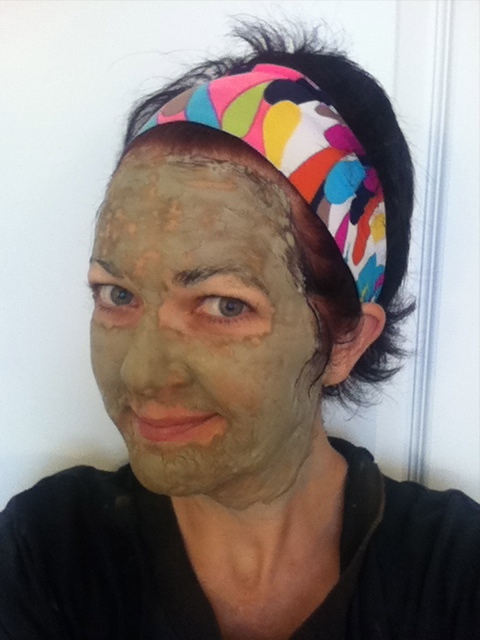 Wellness Mama has a post on the benefits of bentonite clay and there’s a long list of ways to use it! Note from OrganicEater: If you are in the Charlotte area, the blog post above is by a Charlotte blogger, so you can get cultures from her! If you follow my Instagram account, you know I love me some kombucha. Reed’s Kombucha is my very favorite store bought brand! 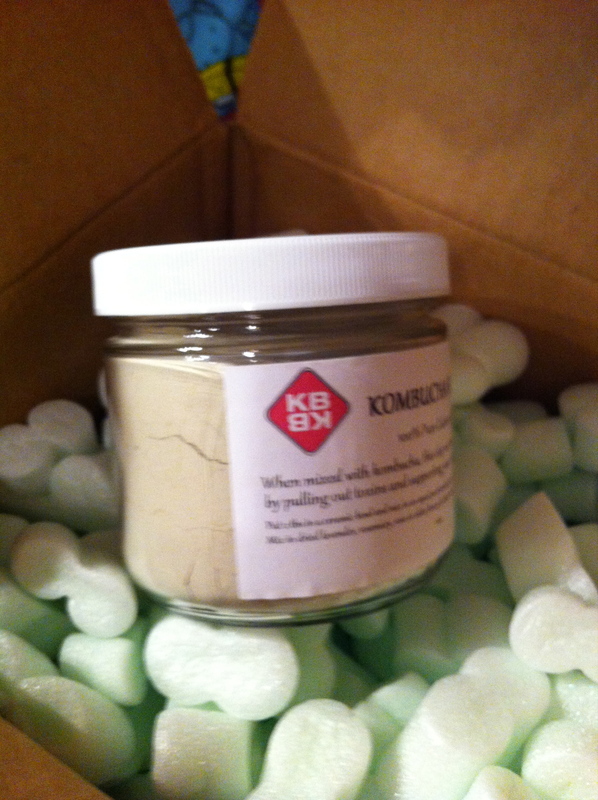 I am so excited to have found a site that will teach me how to make kombucha (and other healthy fermented goodies). I’m posting this to share the goodness with you guys too!! Let me know if you try this! I love ferments! Our gut has anywhere from 600-1000 different microbials working to keep us healthy. We tend to do a lot of things that negatively impact these microbials – diet is one and antibiotics is another. I don’t do antibiotics any more and am grateful that my youngest (12) has never had them and my oldest (14) hasn’t had them since we got her out of the hospital!! But many of us have taken them over the years and they effect our gut balance for YEARS, some any say generations as we pass our gut issues on to our babies. When you’re cutting out sugar, the best place to start is ditching sugar-filled soda. Do you need to see this post from Huffington, on how it destroys your health? Oh, but giving it up is harder to DO than it is to read about, huh? Create a doable plan such as drinking much smaller portions, or less often. I went “cold turkey”, and it was not easy, but if I can, you can too! The longer you go, the easier it becomes to live without it, I promise! You may need some transitional drinks to get you through the hard days. I did. 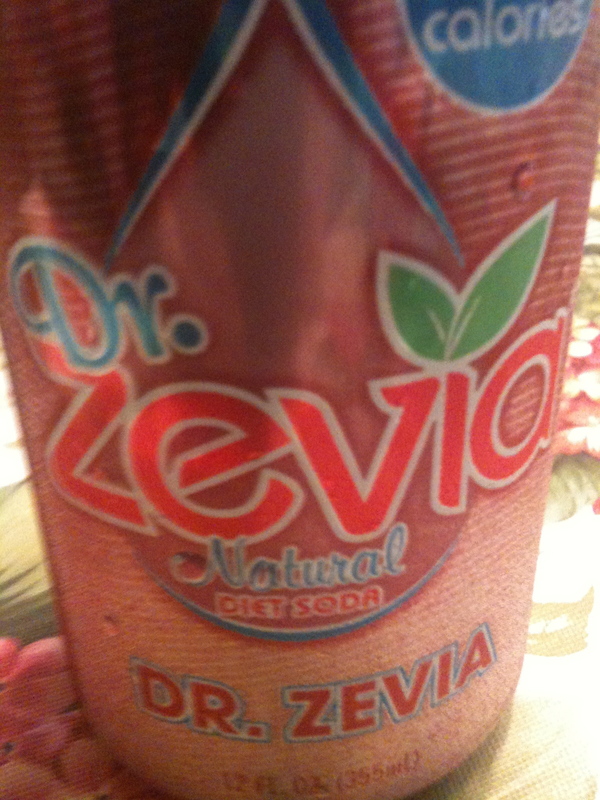 Zevia (found at EarthFare, Healthy Home Market in Charlotte, and EarthFare and Whole Foods) was a good way for me to get my “soda fix” as I detoxed off Dr. Pepper. I needed to hear the can pop open and hear that fizzy sound on those days I felt like I was being deprived (just a few weeks). But that stuff is expensive, and I couldn’t keep that much of it in my budget for long. Fortunately for me, I got over the hump in a few short weeks, and I’m quite happy with my daily tea now, instead. Perfectly happy, actually! And this is coming from a girl who drank 1 or 2 Dr. Peppers every day!! Which brings me to my second suggestion for cutting the soda, try tea. There are only a bazillion different kinds to try, so later I will write an entire post on my love for tea. If you have any questions on it before I can post, please leave a question in the comments and I will get back to you as soon as I can. Tea is beautiful and I love it for so many reasons! 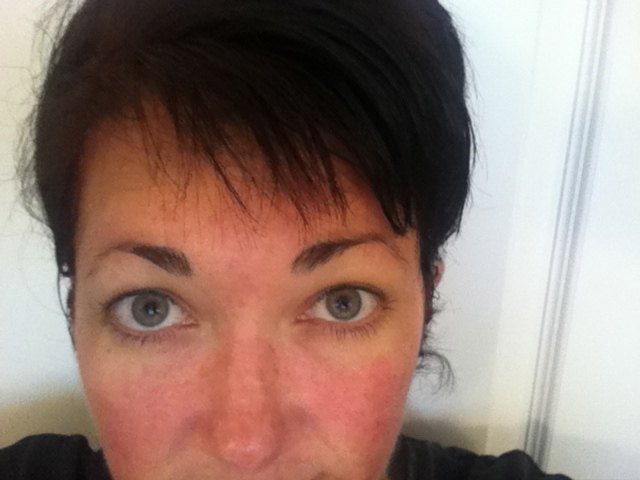 Vanessa at Healthy Living How To has a post on her love for tea and how she got off Diet Pepsi. 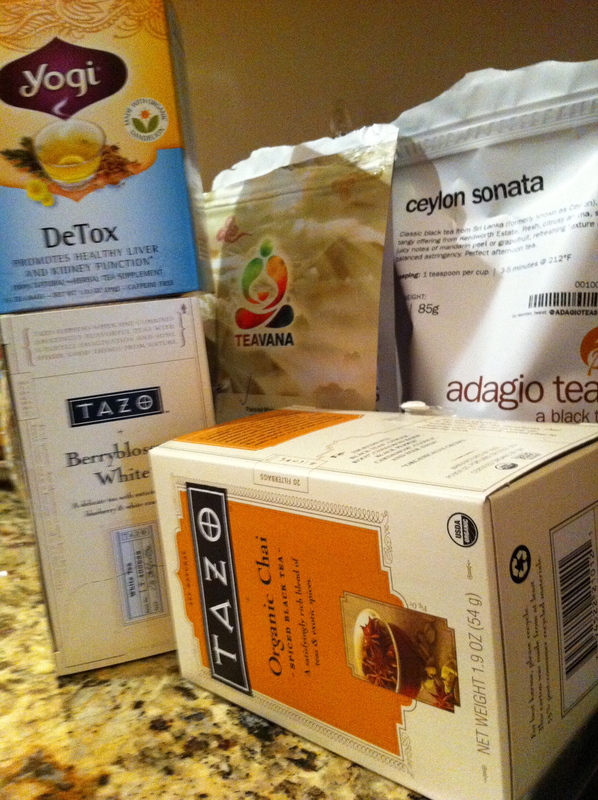 Below is a picture of some of the teas I enjoy, and will post about later. Another healthy suggestion is to try Kombucha. You will need to look at sugar content in the ingredients and decide which is best for you. You can buy it at most health food stores now (it’s all the rage!) or you can Google recipes for homemade kombucha. I have not made any myself yet, so I can’t recommend a recipe for you at this time. If you have a good recipe you would like to share with our readers, please leave it in the comments. It also has a zillion different brands and flavors you can experiment with. It has a fizziness to it, which I really like. Just like with tea, if your first try is one you don’t care for, don’t give up. You may need to try a few before you find one you like. 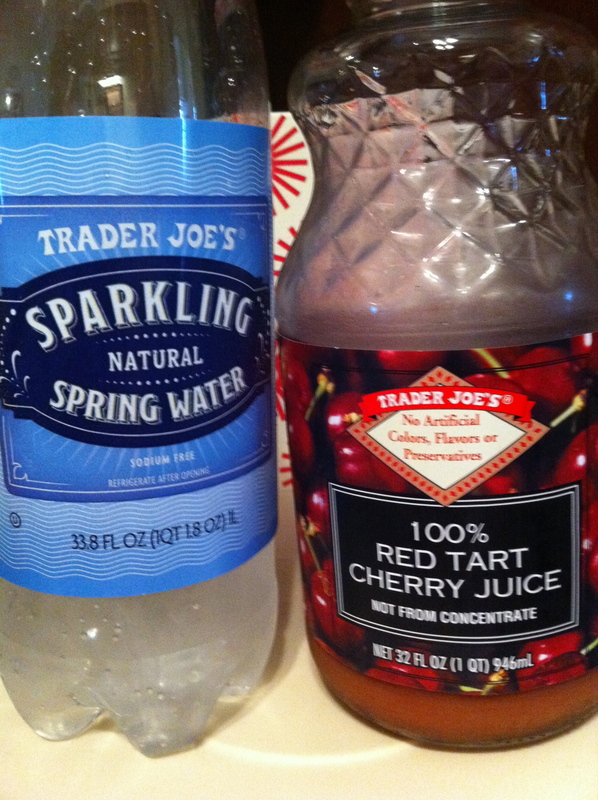 sparkling water and tart cherry juice in equal amounts, splash of aloe juice (may be optional), and powdered organic stevia to taste (see stevia explanation here). Throw it in the blender and blend for about 10 seconds. We made small batches of about 12 oz at a time. You could add ice or frozen cherries to make it a slushy instead. OOOOOhhhh, Cheery Cherry Slushy. Love it. 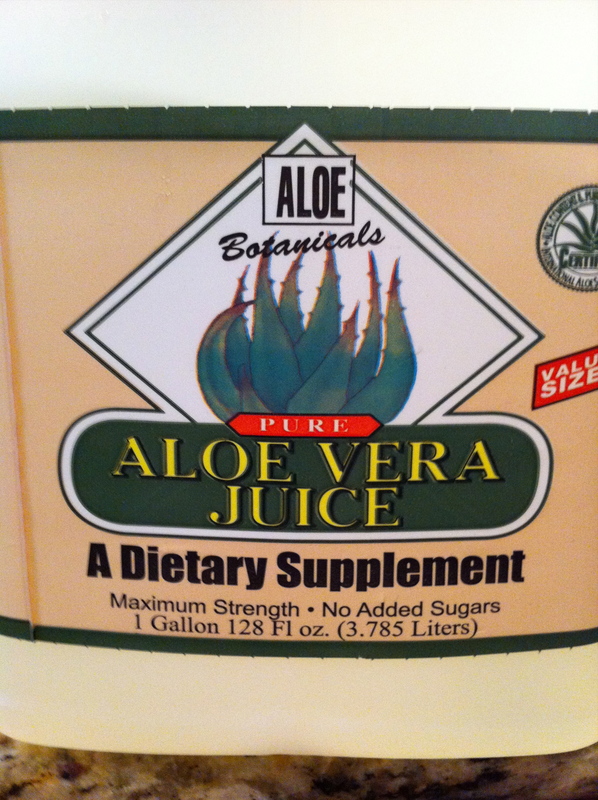 The aloe juice can be a healthy addition, but it probably isn’t necessary for this recipe. We added it for a specific health benefit. READ about it here. 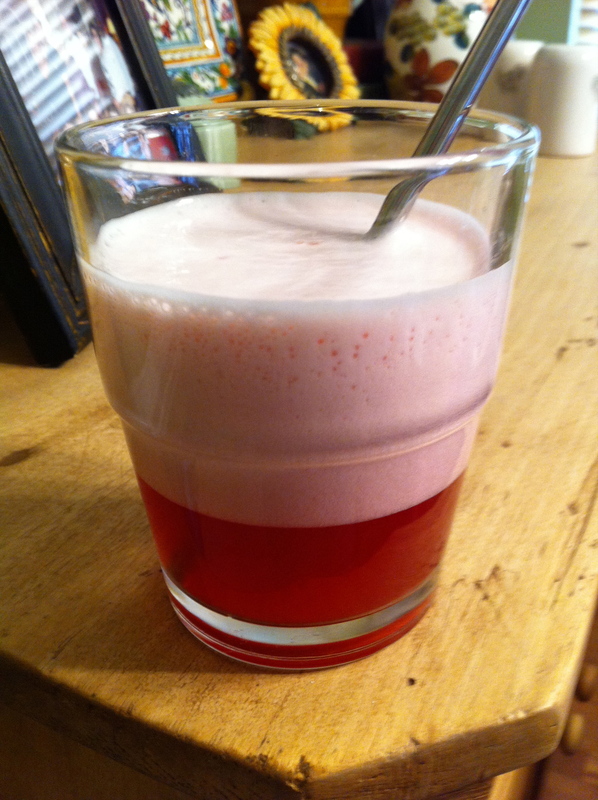 Powdered stevia may be necessary to get that frothy head on top of this, which makes it seem so much more like soda. I used one tiny spoonful (spoon included in jar) for every 4 ounces. 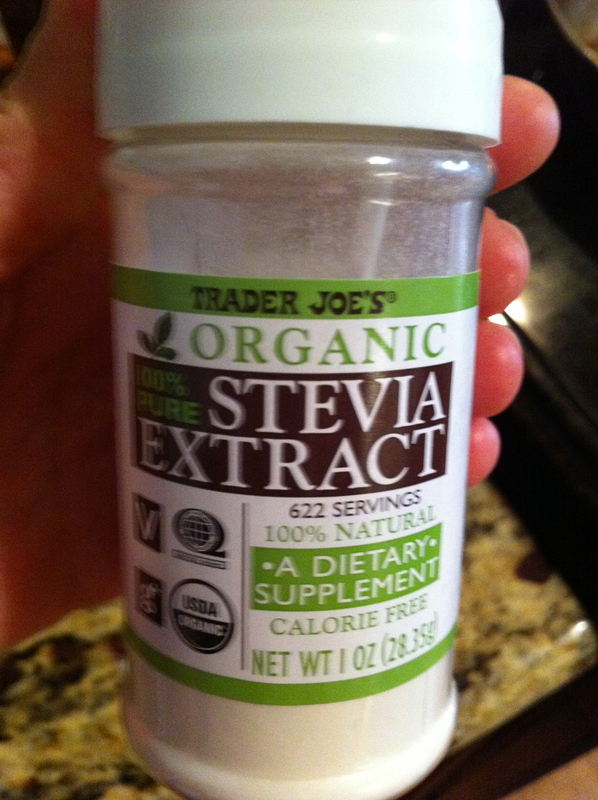 We tried liquid stevia and it did not work for us. Dr. Oz has a video on the antioxidant properties of Tart Cherry Juice , which include decreasing inflammation, lowering cholesterol, and helping with sleep. So, there you have it. So easy! So yummy! So fast! So fun! Cheery Cherry Soda. Yay! Happy transitioning. You can use the printfriendly button below to cut the fluff and just print what you need.